You're probably wondering what Buttermilk Biscuits have to do with the Kingdom of Pastry. Well, in pastry school, you also have to learn how to make breads, crackers and biscuits as well as cake, custards, tarts, cookies, ice cream, confections, jams and a lot of other assorted pastries. So when I was thinking about making something to go with my fresh fruit compotes of the season, I decided to whip up a batch of simple biscuits. This is a baking powder biscuit that can be on your table in the amount of time it takes for your oven to heat up. I like the rich tang of buttermilk, so it's the star in this particular version. 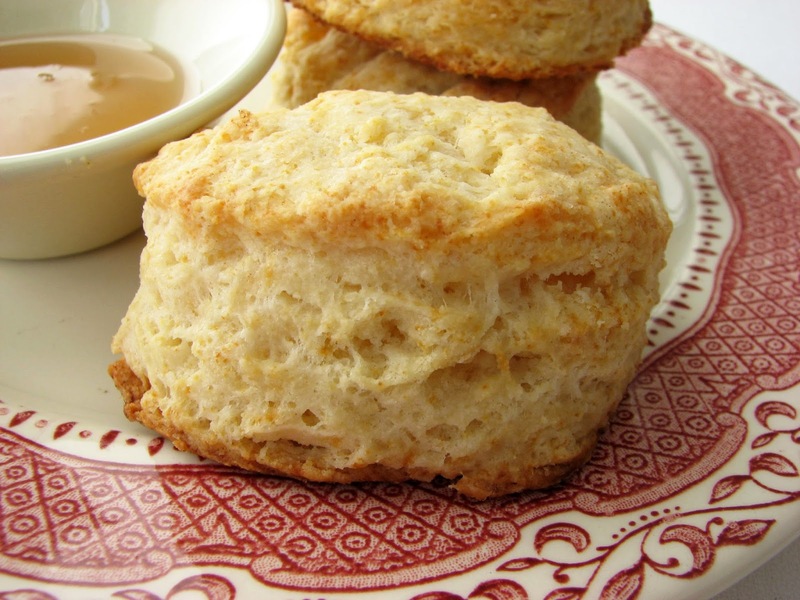 The biscuits are hearty with a crisp crust and an interior that is tender and buttery. And, of course, rather than honey or preserves, these biscuits would make excellent bacon and egg sandwiches or a perfect vehicle for your favorite gravy. This is an occasional indulgence for those lazy weekends when you'd like something a little more soul-soothing. Go for it! - There are just a few things to remember when mixing biscuit dough. 1) Both the buttermilk and the butter must be very cold to produce a flaky biscuit. The colder the butter, the less likely it will be absorbed by the flour, which means as it bakes off that separation will form nice flaky layers. Dice the butter and put it in the freezer while you prepare the other ingredients. 2) Once you add the cold butter, work fast to incorporate it into the flour so that it stays cold. You can use a pastry blender or your hands to get the butter reduced down to pea-sized pieces. 3) When you add the buttermilk, use a fork to stir it together. It shouldn't take more than 10 or so rounds of stirring. The dough will look lumpy. 4) Lightly dust your work surface and your hands with flour. Pour the biscuit mix onto the work surface and pull the dough together with about 3 - 4 very light kneads. You don't want to overwork the dough but you also don't want a pile of clumps. So be gentle and you'll see it come together very quickly. 5) Pat the dough to form a round that's about 1 1/4" thick. Use a 2 1/2" cutter and press down to form the biscuits and lift straight up when you're done. To prevent sealing the edges and to preserve the flakiness of the biscuit, no twisting or turning the cutter. - My oven runs a bit hot, so my biscuits baked in 11 minutes. Start checking about that time. The bottoms should be crisp and a rich golden brown. - There are all kinds of theories about using part cake flour. I prefer straight all-purpose flour but if you'd like to experiment for biscuits that are less sturdy and more tender, you can easily find a recipe that will do the trick. - Add your favorite chopped herbs or chives to the dry ingredients. I like freshly ground black pepper. 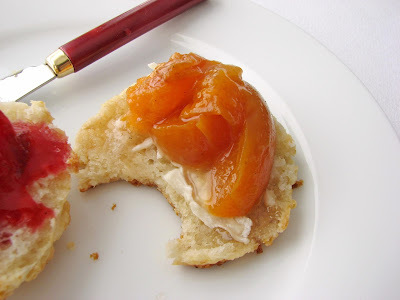 - For something more in the realm of pastry, try Cream Scones. They are perfect for the traditional whipped cream, jam and tea. Or another pastry in the biscuit family is shortcake. Some of my variations are Cinnamon Pecan Biscuits with Peaches and Cream, Oatmeal Shortcake with Plums, Blue Cheese Walnut Biscuits with Pear Compote and Cream, Cornmeal Shortcake with Peaches and Gingerbread Shortcake with Pears. - This is a really great Apricot Compote made with vanilla, honey and cinnamon. Preheat oven to 425 degrees F. Prepare a baking sheet with parchment or a silpat. Sift the flour, baking powder, salt, sugar and baking soda together in a bowl. Add the small pieces of cold butter and, using your hands, toss to coat all the pieces of butter with flour. Working quickly with a pastry blender or your fingers, pinch and flatten the butter into the dry ingredients until the mixture looks like pebbles the size of peas with some smaller crumbs. Make a well in the middle of the flour mixture and pour the cold buttermilk into the well. Using a fork, fluff the flour into the center and gently stir and turn the ingredients until you have a soft dough. Lightly dust the work surface and your hands with flour and turn out the dough. Give it a gentle kneading; about 3 - 4 turns should be enough to consolidate the dough. Pat it into a round about 1 1/4" thick. Use a 2 1/2" cutter to form the biscuits, pushing straight down and lifting up to cut rather than twisting. Place the biscuits on the prepared baking sheet. Gather the scraps and stack them. Gently press and pat them into a piece about 1 1/4" thick and cut out additional biscuits. Brush the tops lightly with melted butter. Bake the biscuits for 11 - 14 minutes or until they are puffed and the bottoms are golden brown. Serve warm. For your British readers: SCONES! Lovely. Anonymous, thank you for that distinction. I do cherish my British readers! 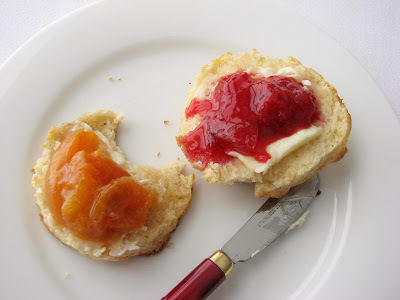 In America, scones have more sugar and are usually made with cream. But yes, same idea, same wonderful bit of delicious fluff. When we were in our twenties we would have nearly all night pinochle games with two nearby neighbors. The games were fast, furious and fun. Inevitably around midnight one of the guys would start a wistful sigh murmuring about baking powder biscuits. That was my cue to sit out a hand, jump from the kitchen table and whip up a steaming basket of biscuits served with butter and homemade jam. Kate, that is hysterical! It sounds like a blast - wow, fresh hot biscuits at midnight. You are a trooper! I love cards but never remember the rules. I'll have to work on that. I love making biscuits and can't wait to try this recipe. Thanks for the bench notes! I already do most of your suggestions, but will have to remember to lift and not twist my biscuit cutter. I've tried a number of average bmilk biscuit methods in the last couple of years. Haven't been satisfied with any of them, but this one seems to be a real winner. I mean, maybe my technique is better, but honestly, I think the increased amount of leaveners here compared to some of the others makes the difference. 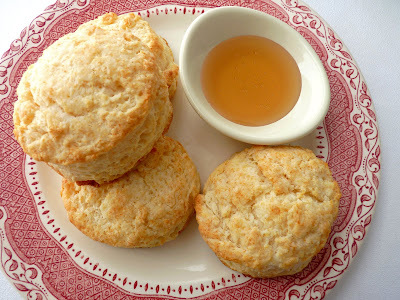 Plus, who doesn't love biscuits on a Sunday morning-- they were perfect with peach butter. Thanks for another good one, it's a keeper. Hey, Bryan! Peach butter, mmmmmm. so cool. As I was planning to make these, I thought I'd toss in some baking soda since it has buttermilk and I agree, I think it makes a difference. So very pleased you enjoyed them. 1. Easy to make. For sure. 2. I added cheddar and jalapenoes. Yum. 3. They turned out fluffy and TASTY!! Oh my gosh, TamraEats, those sound totally dangerous!! denise, thanks for stopping by and I hope you enjoy them. They're simple, plain but I think they hit the spot. Not sure what it is about biscuits and scones but a really good one is quite a thrill!